Emilio Sosa may have entered the public eye as the runner-up on Project Runway’s seventh season (and for his turn on the second season of Project Runway: All Stars), but he was a designer well before he made his debut on the wildly popular series in 2010. The Pratt Institute graduate is a first-generation immigrant from the Dominican Republic who grew up in the Bronx in the 1970s. He recalls a third grade teacher, Mr. Torres, being the one who sparked in him an interest in art. In the fall of 1979, when Sosa was 13 years old, GQ magazine featured the first man of color on its cover. Sosa remembers saving his allowance to purchase the magazine. Flipping through the pages, he instinctively knew that fashion could and would be the outlet for his artistic talent, and he taught himself to sew. The designer says witnessing the hardships and struggles his parents endured in order to guarantee a better future for their children influenced his strong work ethic, which is surely part of the reason he’s able to design for his personal brand, ESosa, Inc., while at the same time designing for Broadway musicals including The Gershwins’ Porgy and Bess, Sense and Sensibility The Musical, and Motown: The Musical. The designer chats with Hispanic Executive about tapping into his Latin culture, the root of all his designs, and his process when designing for Broadway. 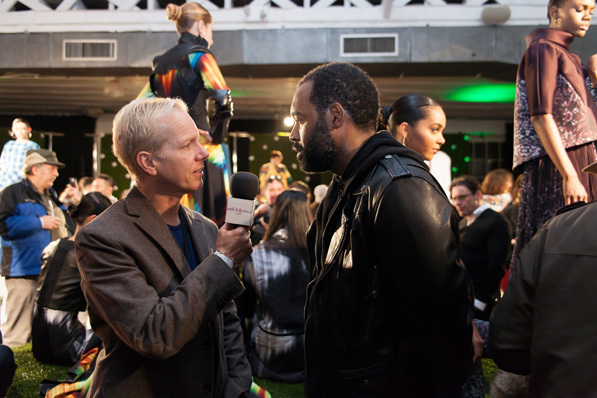 HE: During a Fashion Week interview for your Spring/Summer 2015 collection, you talked about how you’d never before tapped into your Latin culture while designing. What changed for this collection and what about Latin culture inspires you? ES: When I design the ESosa collection, I’m thinking of a universal woman. As a Latino, I’m influenced by the bright colors and certain sexiness that’s evident in my Latin culture. I also grew up listening to great Latin music and being surrounded by aunts and uncles in their Sunday best. I can now look back and use those influences in a modern way. HE: Did you face any adversity as an Afro-Latino designer making your way in the industry? ES: While the fashion industry has a long way to go in terms of diversity, I grew up with the strong belief that hard work and dedication are the keys to success. I believe talent rises to the top, and any challenges I come across I’ve been able to overcome because of my strong will to succeed. For the Fall/Winter 2015 collection at the Mercedes-Benz New York Fashion Week in February, ESosa partnered with printing company Epson to create digital text printing for textiles, resulting in bold and intricate patterns. HE: Who is the woman that you design for? ES: At the root of my designs is the belief that all women, regardless of size and financial standing, deserve to feel beautiful in my clothing. I’m a firm believer that style comes from within, not just the clothing you wear. Style doesn’t come with a price tag; it comes from knowing yourself and what works for you. HE: What is your process when designing for Broadway? How do you get the costumes to help tell the story? ES: When I design for Broadway, I start by reading the script a couple of times before I begin to sketch. I then meet with the director and actors to get their points of view, which I will incorporate into the final design. HE: Talk to me about the differences between designing a collection and designing for Broadway. ES: There is actually not a lot of difference in my approach for a fashion collection or a Broadway show. In both instances, I’m telling a story through clothing. The largest difference is how the clothing or costumes are made. Broadway costumes require more attention to fabric choices and construction techniques. Fashion, on the other hand, can be lighter and softer in the way it’s made. HE: How do you balance your time between designing collections and designing costumes? ES: While there is no perfect balance between my Broadway and fashion careers, I just try to give 100 percent to both, and I have a great team that ensures the best work is produced on both fronts. HE: As you move further away from Project Runway, what is the most important lesson you took from that experience? ES: The most important lesson I learned from my time at Project Runway was to be more open to other people’s opinions of my work without taking it personally. It’s all about the work. HE: What advice would you give to a young designer of color who wants to reach your level of success? What should they know? ES: My advice to anyone who aspires to work on Broadway or in the fashion field is to gain as much knowledge as possible. Whether it’s through formal education or internships, knowledge is power. HE: What are you working on right now and what can we expet from you in this upcoming year?